A shoe shop has kicked the competition to the kerb after scooping the trophy for the best Woodbridge World Cup window display. John Ives Footwear went to town with the bunting and added a goal to its window display as part of the event held in association with the Woodbridge Regatta. A number of businesses participated, incorporating a World Cup theme in their décor. 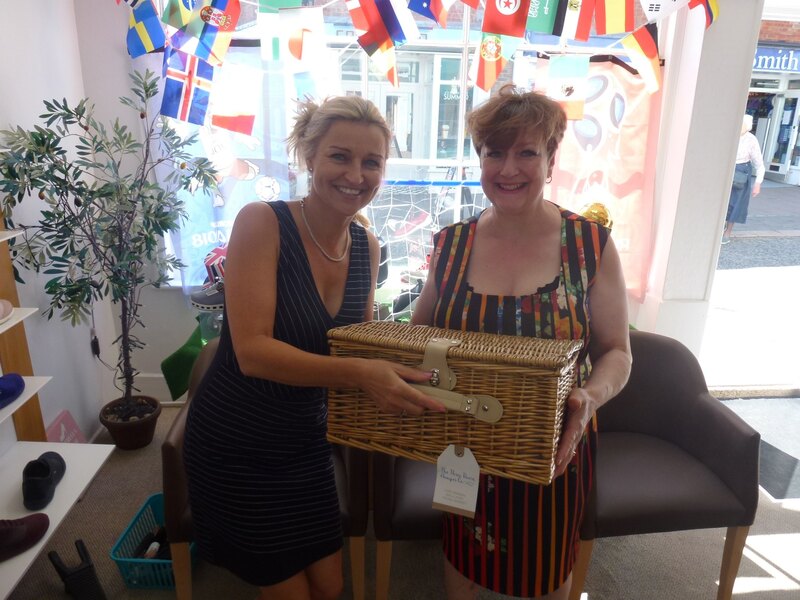 Fay Ives of John Ives Footwear was presented with a luxury picnic basket by Lorna Savoy, Lettings Manager at Gobbitt & Kirby, which sponsored the competition, supported by The Woodbridge Kitchen Company. She said: “We were thrilled to win. The World Cup has got everyone talking and to see the town covered in flags and bunting just adds to the excitement. Scott Matheson-Barr, principal at Gobbitt & Kirby said judges had been impressed with the way the competition had been embraced by the town. “We have a great community of businesses in Woodbridge, many of which are only too happy to get stuck in to something which adds to the colour of our town,” he said.